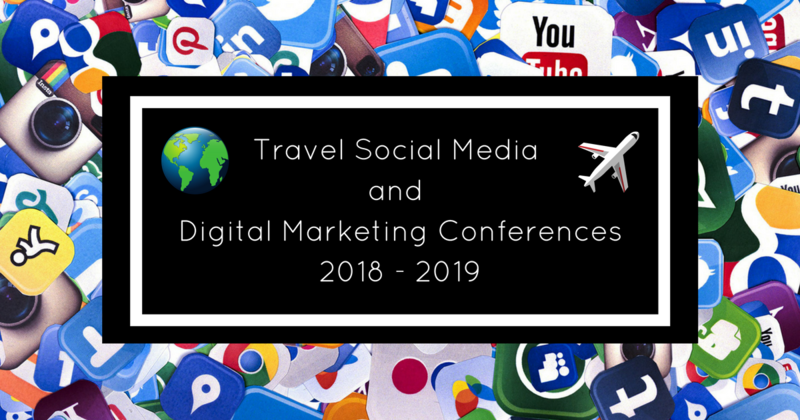 Below is a list of social media and digital marketing conferences in 2019 into 2020 that we feel are of particular interest to the travel industry. Some conferences may have already happened, but remain listed in anticipation of next year’s details. Developed by the Emilia Romagna Region Tourist Board together with iAmbassador, the BlogVille project brings together, since 2012, digital influencers from all over the world to Emilia Romagna, Italy. NBE is a combined blogger experience & conference centred on the annual Matka Nordic Travel Fair in Helsinki. Around 50-60 influencers are invited to tour Finland and then speak/network with the industry at the travel fair. OTM is the largest and most international gathering of travel trade buyers and professionals in India. Learn, network and connect with 1000+ exhibitors and 15,000+ travel trade visitors from around the world in 3 days at OTM. This is a digital travel conference with academia and travel industry professionals in attendance. Technology experts, local authorities and International companies like Expedia and IBM, will come together with academics from around the world to discuss and exchange ideas on industry problems, ongoing research, latest trends and the future of technology and Tourism. Two-day annual conference with a focus on digital marketing and social media for those in the hostel industry. This travel gathering is the biggest tourism event for online influencers in Belgium. The travel gathering is Belgium’s first ever blogger event in tourism. Meet the Media is a one-day networking event for the international travel trade and Irish media, which takes place in the 5* Radisson Blu Royal Hotel, Dublin. This unique event connects media from all over Ireland (print, broadcast, online, digital, bloggers, influencers) with 30 worldwide travel suppliers including airlines, hoteliers, tourist boards and tour operators. INFLOW (Influencers of The World) organises Brand-2-Influencer summits for a range of industries. Travel industry community & publisher, offering a number of conferences focusing on digital technology, social media marketing and travel content. The Women’s Travel Fest is a 3-day event that aims to inspire, empower and connect women in travel. DMX Dublin features over 30 world-leading speakers in multiple presentation streams, and over 900 marketing professionals attendees in a full day of sharing, learning and networking. A Marketing Institute event, DMX Dublin celebrates the crossover of marketing, digital, creative and media. Over the past 5 years it has become Ireland’s must-attend marketing event of the year, bringing together top international and Irish marketing leaders, marketers from multinationals and start-ups, advertisers, creative agencies, digital agencies, online publishers and vendors. Claims to be “the world’s largest social media marketing conference”. With around 5,000 it probably is. A busy programme of presentations, panels & workshops from top social media marketers. IMM is a scheduled-meeting networking event run by Travmedia.com in five locations worldwide. Local tourism organisations & travel brands take stands and meet with bloggers, influencers, traditional travel writers and other travel media over a day. EventCamp is a gathering for restaurant and hotel sales and event professionals focused on one big goal: to learn about innovations that help them increase sales, stay on top of trends, work smarter using technology and data, and grow their business. Over the course of 2 days we will be talking all about content and the people behind it. We will be inviting a wide range of Content Leads and Creators to share their work with you and engage in discussion as they reveal the process behind it. Digital Travel APAC brings together top minds at Asia’s most successful airlines, hotels, OTAs, metasearches, tours and activities, car rentals, cruise lines and tourism boards to plan eCommerce, digital marketing and customer experience strategies for growth in 2019 and beyond. A boutique conference for French travel bloggers, run by We Are Travel. The first edition of the Salon of Travel Bloggers, also called Salon We Are Travel (or WAT), was held in Cannes in September 2014. Since then, each edition has been a real success and welcomes more and more participants. Every year, in a different destination, bloggers and e-tourism professionals meet for 2 days to discuss influence marketing and Networker. North American Travel Journalists Association conference provides the opportunity to engage and network with fellow members – both media and destination representatives – throughout the conference, participate in top-notch professional development, and enjoy the best sites and gastronomy in the host destination. The clue is in the name; a 2-day conference (with several days of pre-conference events) for women travel influencers and industry members. Traverse is a 2-day blogger conference aimed at new bloggers and influencers developing their skills. It started in Brighton in 2013 and moved around the UK (Newcastle, Kingston-upon-Thames, Cardiff) ending up in London in 2017 with around 500 delegates. In 2018 it moves to the continent (Rotterdam). Speakers are mostly pro-bloggers, and experts in marketing, editing, videography, etc. Travel & Tourism brands use the conference and its social events running over the preceding week, to network with up and coming bloggers. Traverse also run half the social media programme at World Travel Market, and a number of other social media marketing & networking events. The Ping Helsinki Business Festival brings high-end professional influencers together with brands to talk about content and influencer marketing. DTS focuses on digital marketing, eCommerce strategy and customer engagement for travel, hospitality and leisure companies. Digital Travel is for travel, hospitality, and leisure executives in digital marketing and customer experience who are looking to build world-class brands. Join over 75 of the industry’s leading brands at Digital Travel, as they meet, network, and inspire. FTE is an event and online media business focused on the air passenger experience. FTE has four annual events around the world: FTE Global, FTE Asia EXPO, FTE Europe and FTE Ancillary. Every FTE event includes ‘On the Ground’ and ‘Up in the Air’ conference streams, and an exhibition of the latest solutions and services. Launched originally as “Travel Blog Exchange”, TBEX runs multiple annual travel blogger conferences for up to 600 blogger & industry delegates, worldwide. TBEX conferences nominally run for 2-3 days but there is usually a programme of pre-TBEX tours & events and post-TBEX fam trips that expand the whole thing out to a week or more. Major (4000 delegates) digital marketing conference with a packed programme of presentations, panels & workshops. INBOUND 2019 is more than just four days of learning and inspiration. It’s a place where you can step back from your day-to-day, and think about big ideas, not if you remembered to email Karen back. Finally, you’ll have the mental space to look at your opportunities and challenges in new ways and from new perspectives. If you think you have your best ideas in the shower, you haven’t been to INBOUND yet. STB is a small conference putting together travel influencers with local & regional tourism organisations and travel companies. This year the organisers (who also run half of the social media track at WTM London) say they are planning a simple one-day event in September. This three day conference will connect you with industry leaders, influencers, and celebrated writers through keynote speeches, small group writing and photography workshops, breakout tutorial sessions, and industry panels. You will learn what’s working in today’s competitive travel industry, timeless business practices, and the skills you need to succeed as a creator. STS, now in its fourth year, is a forward-looking conference developing new ways and ideas for the travel & tourism industry to work with top professional travel bloggers & influencers who are there by invitation only. One highlight is the Think Tank which produces policy on blogger-industry issues. The event is Norway’s largest travel conference with a sole focus on digital marketing and use of technology within the industry. It is organized by Usus (former Visit Southern Norway) and supported by Innovation Norway and NHO Reiseliv (The Norwegian Hospitality Organization). Digital Travel Connect is the one-stop shop for eCommerce, digital marketing and customer experience executives. The event aims to inspire travel brands – from all verticals, including airlines, hotels, OTA and meta-search, cruise lines, rental cares and disrupters — to embrace and test transformative technology in order to master customer personalization and boost their omni-marketing strategy. Digital Travel Connect is an invite only forum which is strictly limited to senior level (VP and above) digital marketers in the travel industry. Popular and practical event. A Relationship Relationship Between Travel Agencies, Influencers, Social Media Managers and Tour Operators. Annual convention held by the Society of American Travel Writers. We’re really excited to be taking #DTTTGlobal to Helsinki in 2018, a capital city that is going through an exciting transformation. With a focus on innovation, entrepreneurship and all things digital, Helsinki is the ideal host city to line up some amazing keynote speakers and talks from industry around the world sharing their insights in digital. Join us for two exciting days of inspiration, innovation and networking and be part of the tourism industry’s most important gathering of future thinkers. Make sure you save the dates on 29th & 30th November 2018. A new event, to connect travel bloggers and influencers in the U.S. Midwest region with Midwest CVBs and DMOs. Other Travel Social or Digital Marketing Conferences? The list is meant to be as comprehensive as is possible. If you are running a social media conference or have attended digital marketing conferences aimed at the travel industry that you feel should be on this list, please contact us.